‘I don’t think creativity comes in a vacuum; it’s always in response to something you know, something you’re familiar with’, says Bianca Chu, her sister, Christie, nods in agreement. 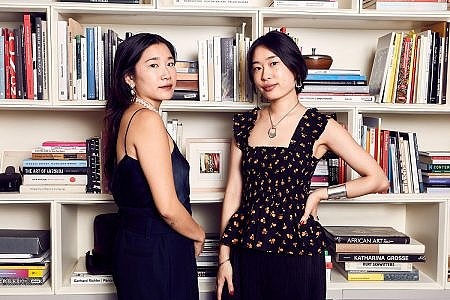 The pair grew up in New York - Christie, an art journalist and jewellery designer is now based in Shanghai, and Bianca, a gallery director, in London. ‘People think we are twins’, says Christie, ‘but Bianca’s always had this very stable track, and I like to diversify”. One thing the sisters do have in common is a strong creative streak - their appreciation for all things aesthetic was garnered ‘by osmosis’, via a childhood spent immersed in design, ‘although’, says Christie, ‘it was never forced on us’. We met the pair in their London home, to talk about how heritage, aesthetic and contemporary art inform their jewellery collections. Tell me about your careers? C: After graduating I worked for Nylon Magazine, then became a culture writer for Artnet News - I still freelance for them. After I left artnet full-time I took some time off, consulted for Georg Jensen and travelled to Thailand to make jewellery. Now I work on brand development for J. Cricket, a Shanghai and Milan-based Womenswear brand, as well as design jewellery in my spare time. I created the jewellery for Saks Potts’ August fashion show. B: I’ve been in London for eight years - I went to Edinburgh and studied History of Art and Chinese studies, and lived in Beijing in my year out from University. We’d grown up going to museums and exhibitions - it was second nature. My first major internship was at Sotheby’s in Hong Kong. When I graduated, I started in the contemporary department at Christie’s. I moved to Sotheby's to reposition their contemporary galleries - the S2. We created a space to collaborate with independent galleries, artists or estates - essentially our own start up gallery inside the Sotheby’s business. We have autonomy over the programme - the art world is moving away from the mainstream white male story; finding alternative histories that need to be told. Where does your creative gene come from? C&B: Our parents were born in Taipei, my father moved to America when he was young and my mother went to New York in the 1970s to study fashion. So by proximity, travel and creativity has always been important for us. When we were younger, we travelled extensively with our parents and went to every major museum. Our father started in the apparel business - he founded Nautica in the 1980s. Christie, how much do you think your culture dictates the direction you’re going in now? C: I studied Art History and East Asian Studies- it opened up my understanding of where my parents came from. Although they’ve been in America for 30-40 years, they still have strong ties to Asia. Opening up my eyes to different cultures very much informs my design sensibility and philosophy. My first jewellery collection was inspired by Chinese antiques and the different philosophies rooted in the country’s culture translated into tactile organic shapes. 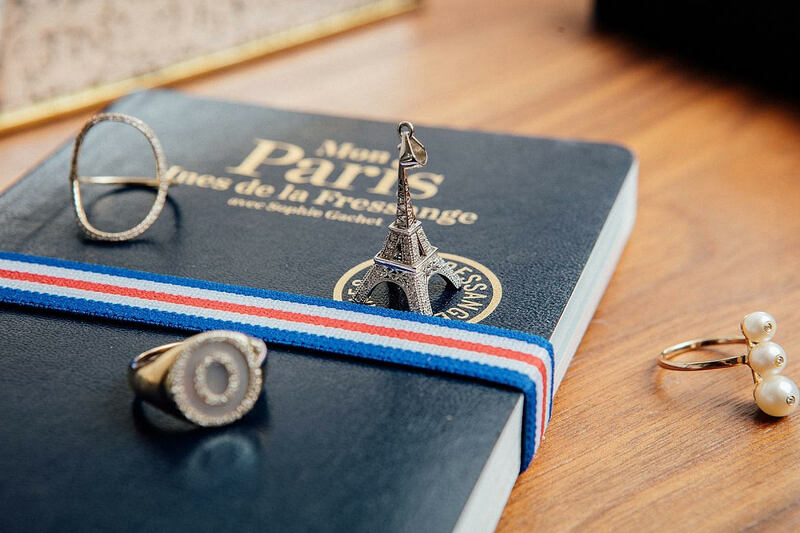 You’ve travelled all over the world - do you see different attitudes to jewellery? C: In New York, anything goes - from the Upper East Side moms decked out in oversized jewels, to the downtown kids in chokers. In China people love gold, and like to know where a stone comes from - whether it’s valuable - but taste is evolving. In Scandinavian it’s low-key - silver, modernist forms. Jewellery is a signifier across different cultures; in primitive societies, they would transfer necklaces to different chiefs in a tribe to show the transition of power. Bianca, you curate art for a living but tell us about your personal collection. Collecting art is a deep seated passion of mine. I buy pieces I want to look at every day in the same way I only buy jewellery that I would want to wear every day. Some pieces of art that I bought early on, I am not so sure about any more. Your taste evolves over time, that is the joy of collecting. What does jewellery mean to you? C:. It has to be beautiful and wearable. 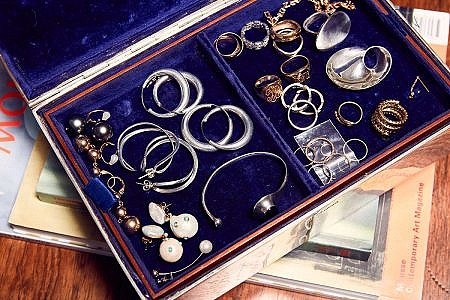 When our mother arrived in New York from Taipei she brought a bag of jewellery with her. They were talismans passed down from her parents but also, in a sense, a safety net. She has now passed some items she bought on to us. That’s what’s special about jewellery - I’m fascinated by the various life cycles it can have. C: I wear a lot of my mother’s rings, like this Cartier trinity ring. My mother always buys things in threes, because there are three women in this nuclear family. I like that it’s in different metals - rose gold, white gold, yellow gold - that’s very much my vibe, mixing metals. B: I love this Bulgari ring - it belonged to my mother’s older sister - she and I were born in the year of the snake. The stone is an emerald which is my birthstone, so it carries another meaning. B&C: We we were very young we used to buy Aaron Basha - those little shoe charms for a bracelet; every year we’d get one. I think that’s partly why we like to collect things, every part makes the whole - collecting or procuring things to make something complete. How would you describe your jewellery style? B: I like statement earrings, so I can wear all black, with a detail that’s artistic. I like pieces I can wear everyday - to work, out to dinner. I travel a lot so I need designs that go with all kinds of outfits for different occasions. C: Simple, timeless, classic with a twist. I like jewellery that has attitude, is an interesting shape - how it fits the ear, a hand, or is made from an unexpected material. A certain feeling or energy when you put it on.